It’s one day every year that brings hundreds of local volunteers together to beautify the community. 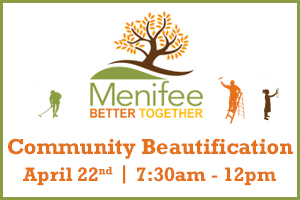 Sign up today for the annual Menifee Better Together Event on April 22nd to help clean up, plant and enhance locations throughout the Menifee, Quail Valley, and Sun City communities. This year’s volunteers can help Habitat for Humanity with a senior home revitalization, mulch project and more. All volunteers will be treated to a BBQ lunch. See you there!